Gold stocks have to do more to confirm they are in a new bull market. Sure, they’ve surged above key moving average resistance and breadth has improved. However, the gold stocks have not yet broken the pattern of lower highs and breadth, while improved, is not at bull market levels yet. Let’s review where things currently stand. 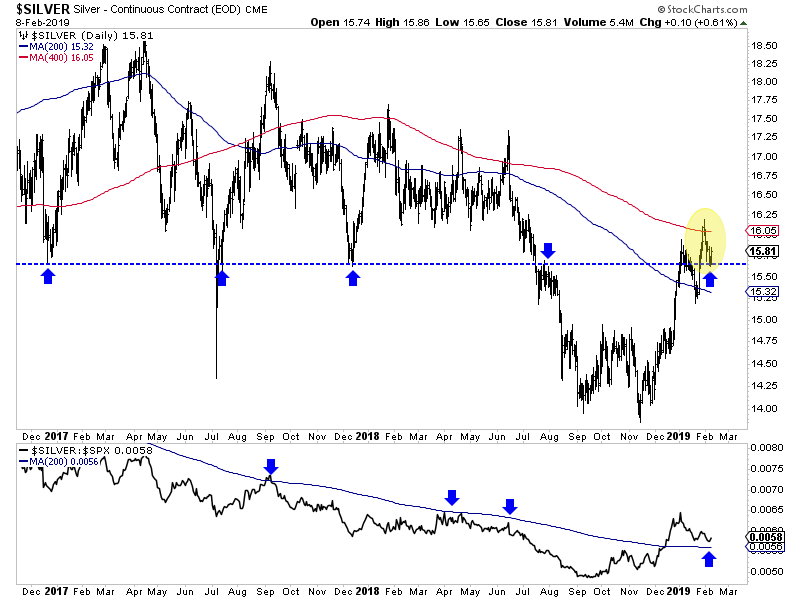 In recent weeks GDX and GDXJ surged above the critical 400-day moving average which has been an excellent indicator of the primary trend dating back to 2012. That’s positive and hasn’t happened since the summer of 2017. Moving forward, I see two plausible scenarios for the gold stocks. 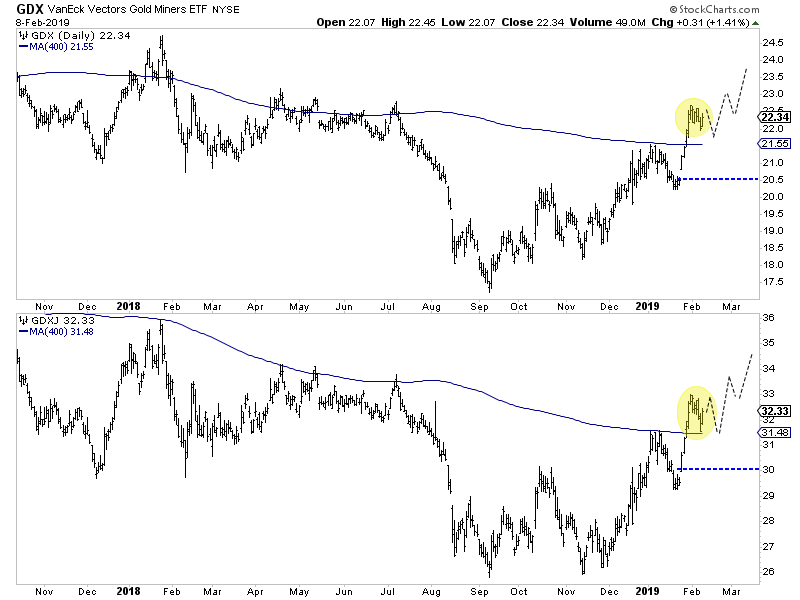 They are either going to build a bullish consolidation (as I’ve sketched out below) or they will have a longer and deeper retracement which could lead to a test of the 200-day moving averages (not shown) near $20.50 for GDX and $30 for GDXJ. In the bullish scenario, look for the miners to hold above their 400-day moving averages and build a tight consolidation. If that develops, we would gain strong confidence in a bullish outcome. In the bearish scenario, the miners would sell off below recent lows and threaten a test of the 200-day moving averages and the nearby open gaps. Also, keep an eye on Silver, which like the miners will outperform when the sector trend is established. Note that on Thursday Silver bounced from the $15.60-$15.65/oz level which has been a critical level over the past two years. (See the arrows in the chart). Should Silver hold that low then it should be able to rally above its 400-day moving average for the first time in over a year and test $17.25. 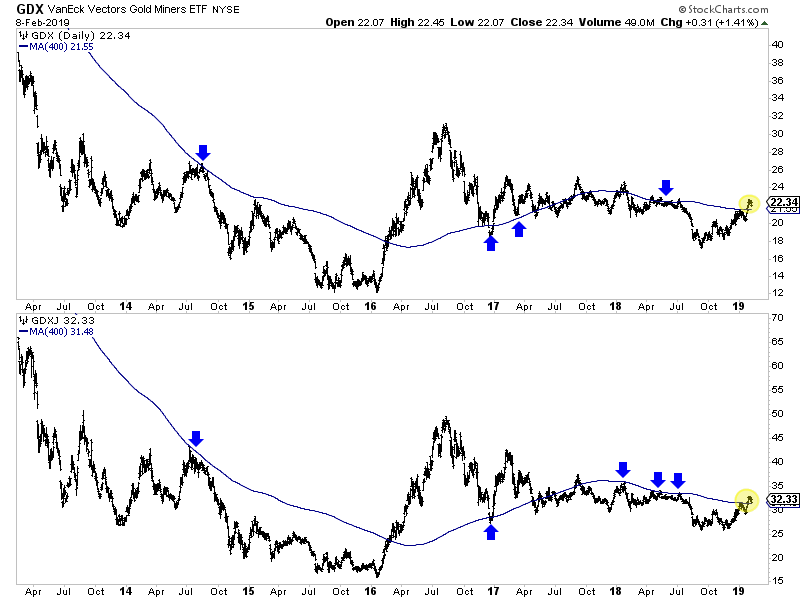 At the bottom of the chart we plot silver against the S&P 500 and according to the 200-day moving average, that relative trend has turned in favor of Silver. The bottom line is if GDX, GDXJ and Silver can maintain the lows from last week and firm up against the S&P 500 then they are likely going higher. If those lows break convincingly then look for a longer and deeper correction. Essentially, should a bullish consolidation develop, we will prepare to put more capital to work. If not, then a deeper and longer correction is more likely which means we can be patient. To prepare yourself for some epic buying opportunities in junior gold and silver stocks before this bull market really gets going, consider learning more about our premium service. Jordan Roy-Byrne, CMT is a Chartered Market Technician and member of the Market Technicians Association. He is the publisher and editor of TheDailyGold Premium, a publication which emphasizes market timing and stock selection, as well as TheDailyGold Global, an add-on service for subscribers which covers global capital markets. He is also the author of the 2015 book, The Coming Renewal of Gold’s Secular Bull Market which is available for free. TheDailyGold.com was recently named one of the top 50 Investment Blogs by DailyReckoning and WalletHub.